This Thanksgiving weekend, I'm taking some time off to be with family -- but never fear, you'll still have sparkle to enjoy! I've updated a few early blog posts from the archive with new information and/or photographs for your reading pleasure. Enjoy! But even though it's such a knockout, its provenance is a bit unclear. This tiara gets its name from its empire style, not because it came from imperial vaults. It's an early nineteenth-century piece. For years, there were two major theories posited about how it arrived in Luxembourg. One traced it back to Romanov Russia via Grand Duchess Elizabeth Mikhailovna, the first wife of Grand Duke Adolphe. The other pointed to Adolphe's daughter, Grand Duchess Hilda of Baden, who died without descendants and may have left jewelry to her nieces. 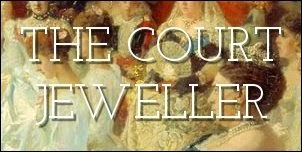 But the ladies over at Luxarazzi have done some digging into the family's jewel inventories, and they have ascertained that the piece was in the family's possession by 1829 (because that year, the jeweler Jakob Tillman Speitz made alterations to the piece), making both of those previous theories impossible. It's also twice been used as a wedding tiara by members of the family. In 1919, it was worn by Grand Duchess Charlotte to marry Prince Felix of Bourbon-Parma; they're the grandparents of the current grand duke, Henri. Charlotte's younger sister, Princess Hilda, also wore the tiara at her wedding to Adolf, the 10th Prince of Schwarzenberg, in 1930. The tiara was worn regularly by Grand Duchess Joséphine-Charlotte during the twentieth century, and today it is worn by her daughter-in-law, Grand Duchess Maria Teresa. She tends to bring out the tiara only for the grandest of occasions, and it's easy to see why!